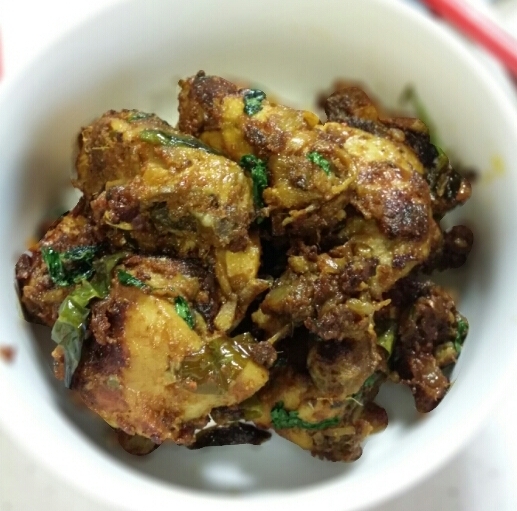 This is one of my favourite chicken recipes. It’s really easy to prepare but so tasty that one would think you’ve spent hours toiling away in the kitchen. I’ve used a home made Masala Podi (will post the recipe soon), but you could easily substitute with your favourite garam masala. Try this at home, I’ll guarantee that you’ll never look at chicken the same way again. Heat oil in a large pan, add cardamom pods, bay leaf, cloves and mace. Once fragrant, add onion and fry on a low heat until soft and golden. Add green chillies, curry leaves, coriander stems, sliced ginger and garlic and cook until fragrant. Add chicken with any excess marinade and stir well. Cook covered (don’t add any water) on a low heat cook until the chicken is cooked through. Remove the lid and continue cooking until the gravy dries out. Then arrange the chicken ensuring that it’s touching the bottom of the pan and continue cooking. This will form a nice crust on the chicken. Turn chicken pieces over and repeat until well-coloured on all sides. Stir coriander leaves through and serve hot with rice. Enjoy!